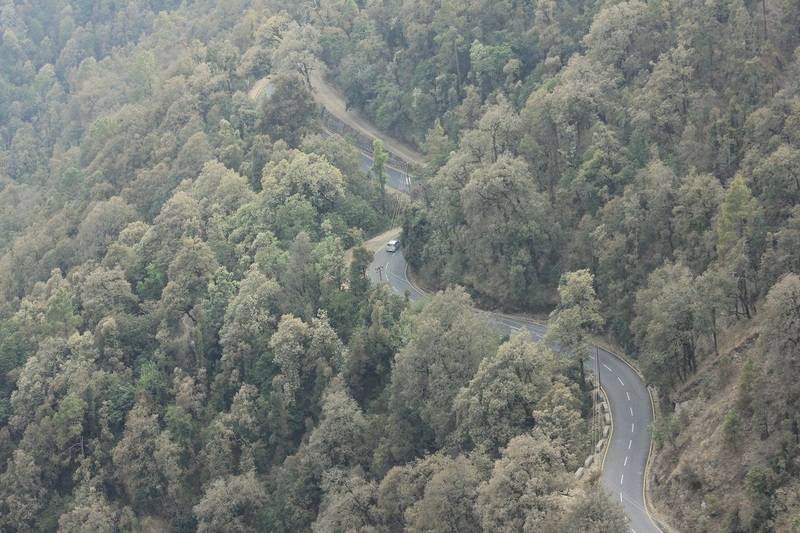 I recently stayed at the White Peaks at Gagar, Uttarakhand. There is walk right next to the cottage that goes uphill. 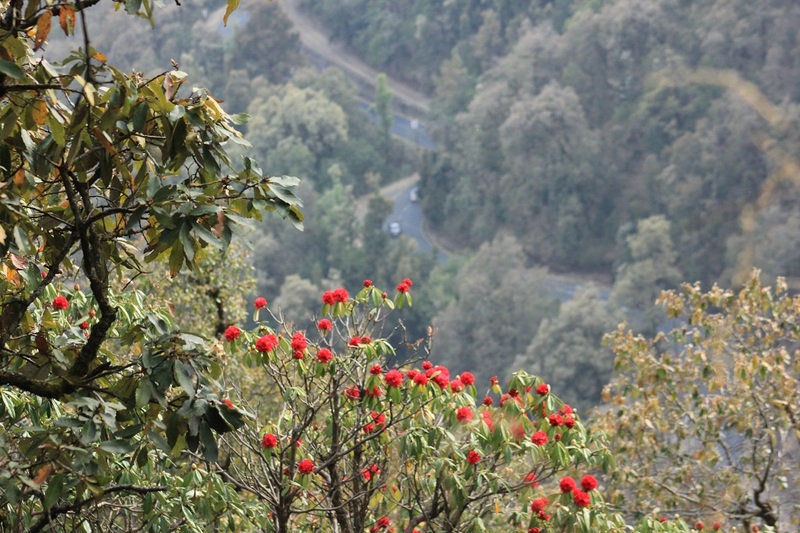 In the month of April the area was full of rhododendrons flowers at Gagar. 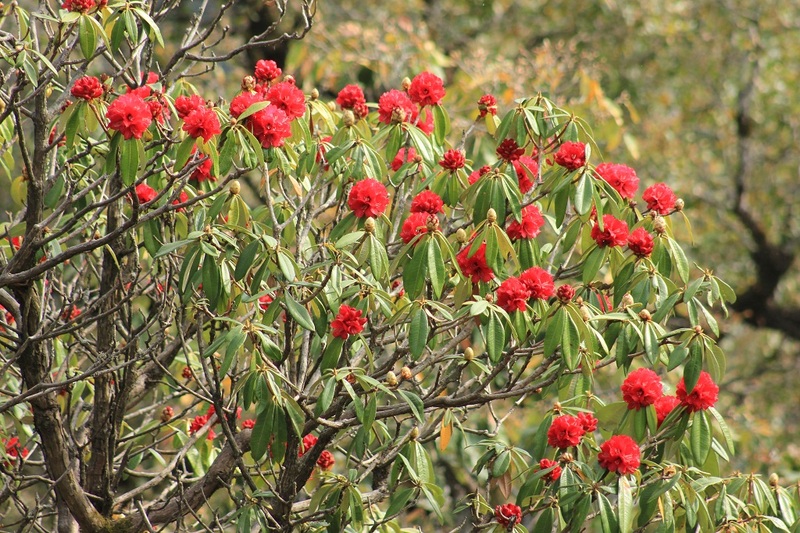 Rhododendron is known as buransh ( बुरांश) in Hindi. 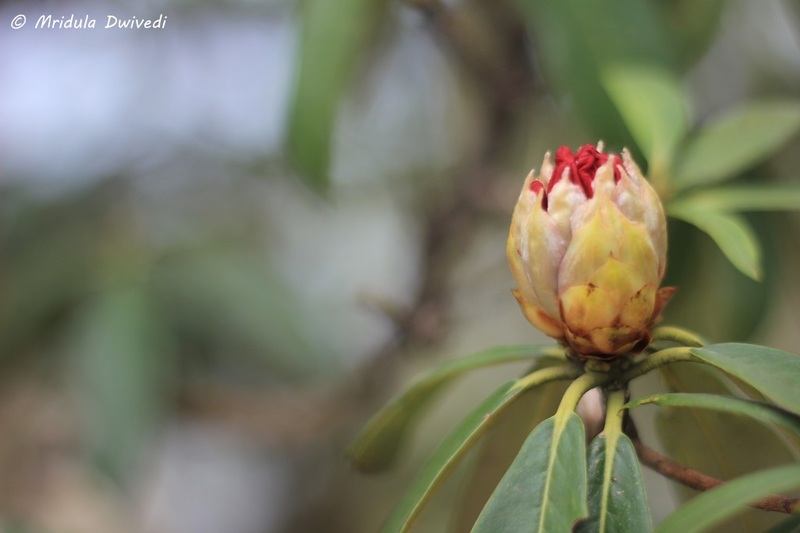 I am no stranger to rhododendron flowers, I saw them many times while I trekked. But when I used to teach, trips in April were generally not on as the semester would be on. 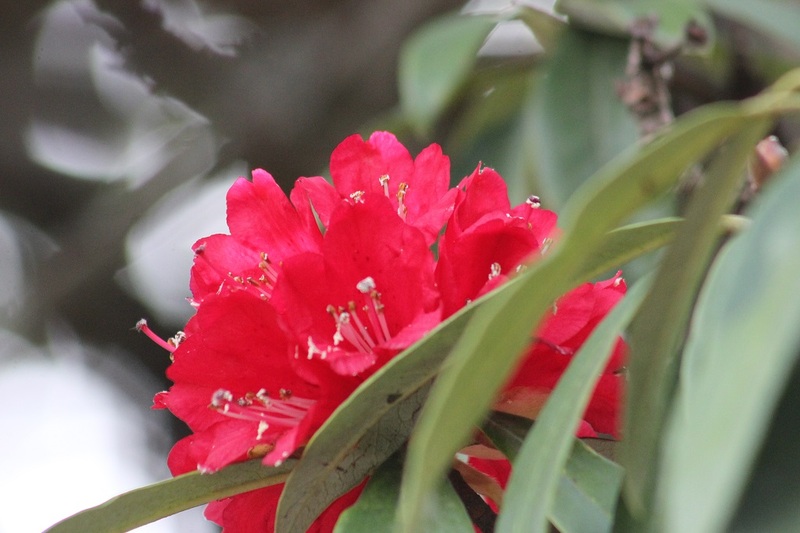 And the rhododendrons bloom in numbers in April! The walk went steeply uphill for a while. I walk at a crawling pace but walk I will if I get to see a quaint mountain path! 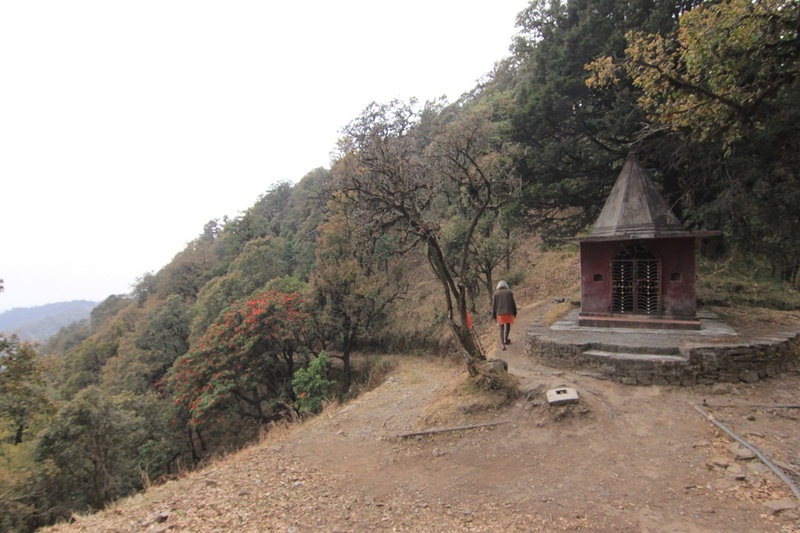 Before I started Mohan (the caretaker at the White Peaks) told me the trail goes up to a temple. 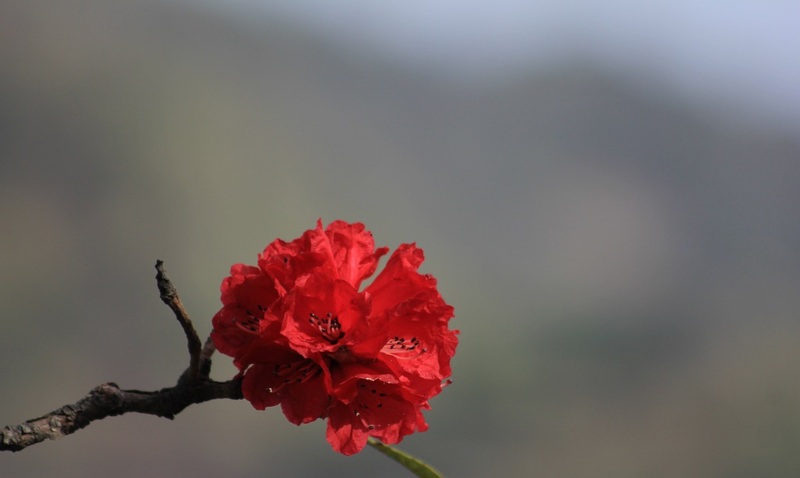 There were rhododendrons everywhere, on the road, on the trees, close to the road, as far away flash of red too. It felt as if I was in an enchanted forest. A Bunch of Wild Flowers! Rhododendrons certainly didn’t have a monopoly on the route. 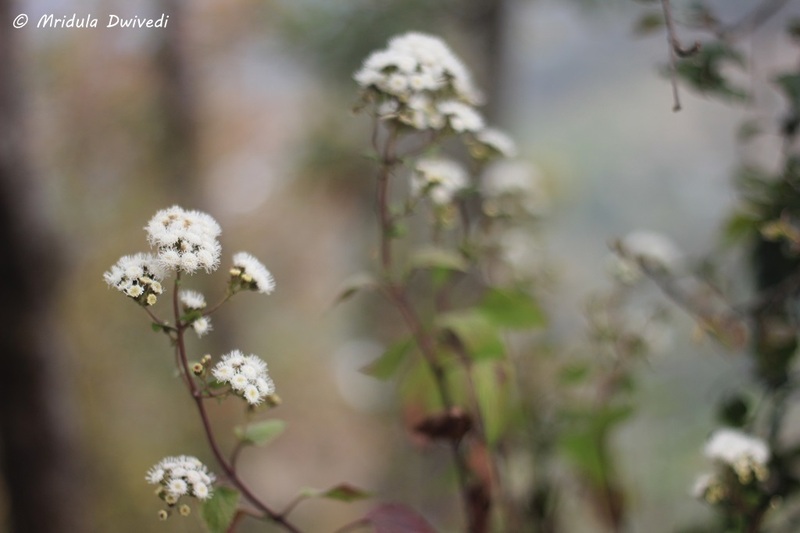 The white flowers competed for attention as I walked. 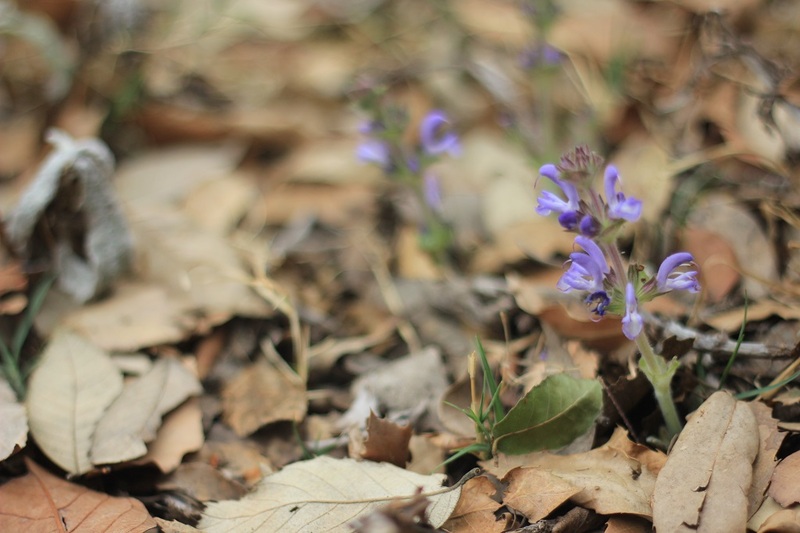 I noticed these pretty purple flowers too, barely out of the ground, but the flavor of the month certainly were the rhododendrons with their compelling presence everywhere! I have a few words to describe unhinged behavior, they are crazy, berserk and bonkers. They denote craziness with increasing intensity in my vocabulary. I certainly went bonkers on the walk. In fact I hardly walked. I would take a few steps and then stop dead in my tracks. Why Not the Whole Tree? I would stop dead in the track because I only took the closeup and I forgot to click the whole tree! To click the whole tree I would need another lens. I would take the shoulder bag down, change the lens, put the bag back on the shoulder and then decide that I wanted a closeup after all! The bag routine would be repeated again, for the change of lens. No wonder I reached nowhere that day. But who cares, when nowhere is this beautiful! It was that kind of a walk where I got a glimpse of civilization far far away. I could see a road somewhere from my perch and I was happy to be away from it, at least for a few days. With a Mountain for the Backdrop! While I was still mulling at the closeup or long shot question, the light was fading out a little. It was an overcast day, but the sun was struggling hard to have a say, even if it was towards the end of the day! 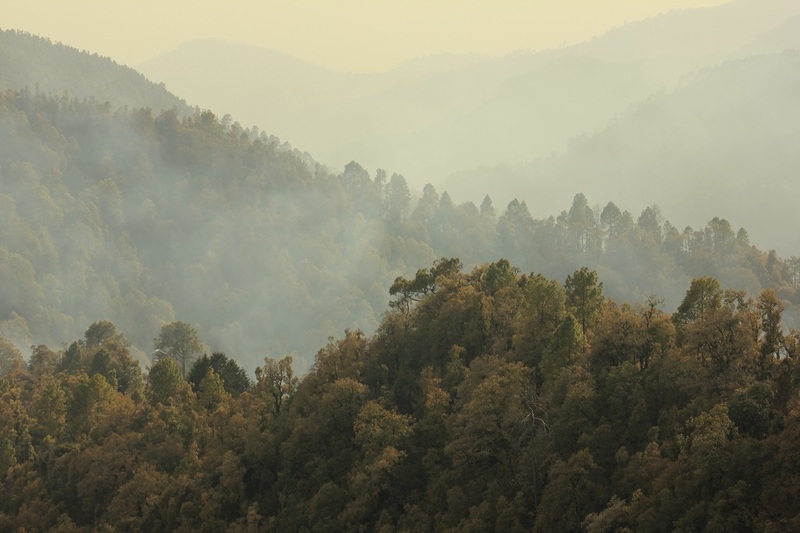 The Smoky Evening in the Hills! As the evening came sky became mellow and the smoke signals went up, it was time for winding up! I decided to walk just a little ahead. On the walk I just met three people. The first person, was a local hurrying up to home tucked somewhere behind the mountains. 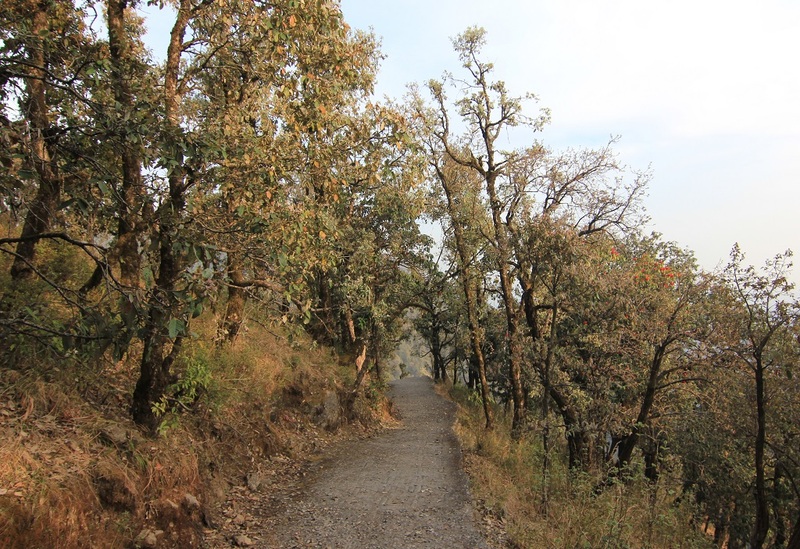 The Walking Trail at Gagar! The other two people I met were sadhus. I greeted them and one of them asked what were I up to? I told him I was staying at the cottage and I just came out for a walk! I would be heading down soon. The Smaller Temple Located on the Way! I asked if this was the temple, to which they told me the main temple was still a kilometer away. I decided to go there in the morning. The Most Spectacular Rhododendron Tree I have Ever Seen! 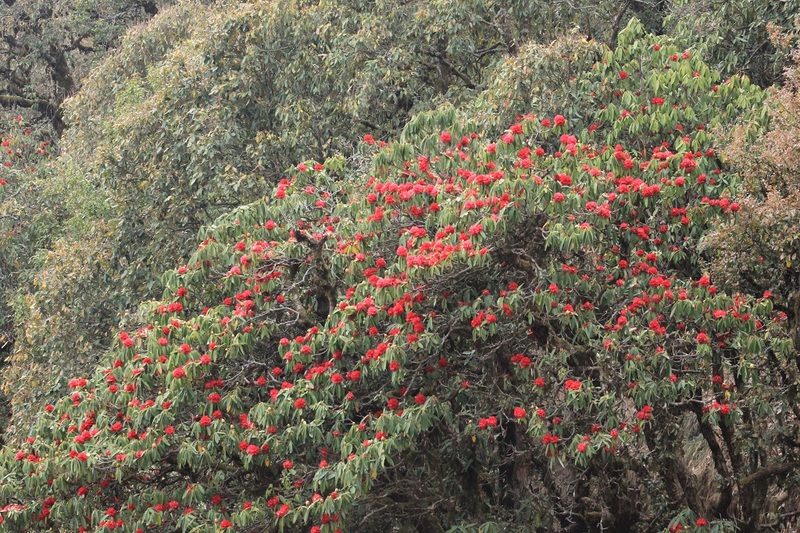 Close to the temple was this giant rhododendron tree full of blooms. I decided that the small temple and the giant tree were reward enough for the day. 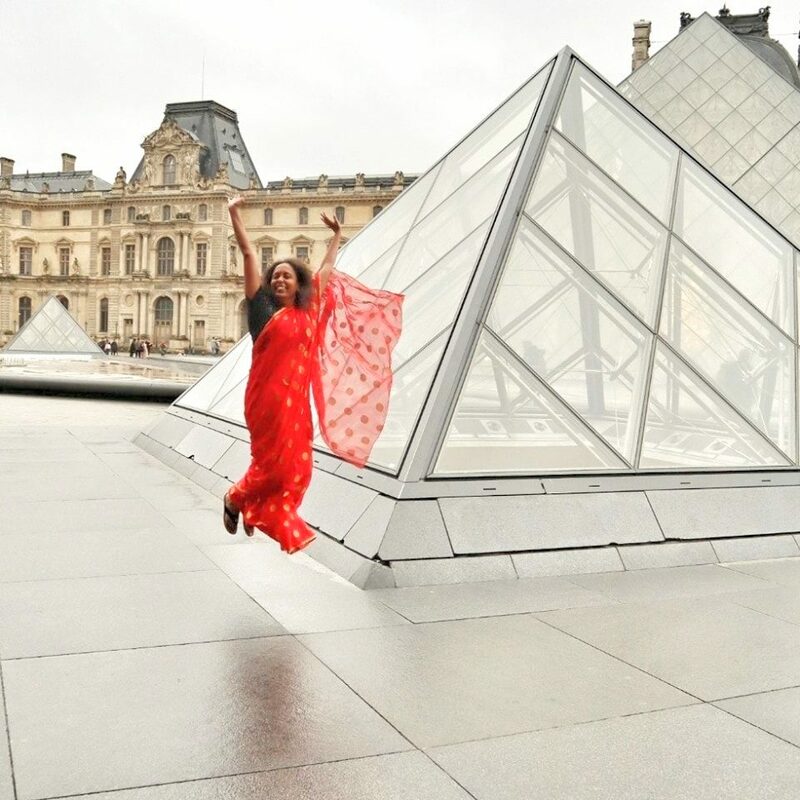 I decided to head back with a promise to go to the main temple the next morning. 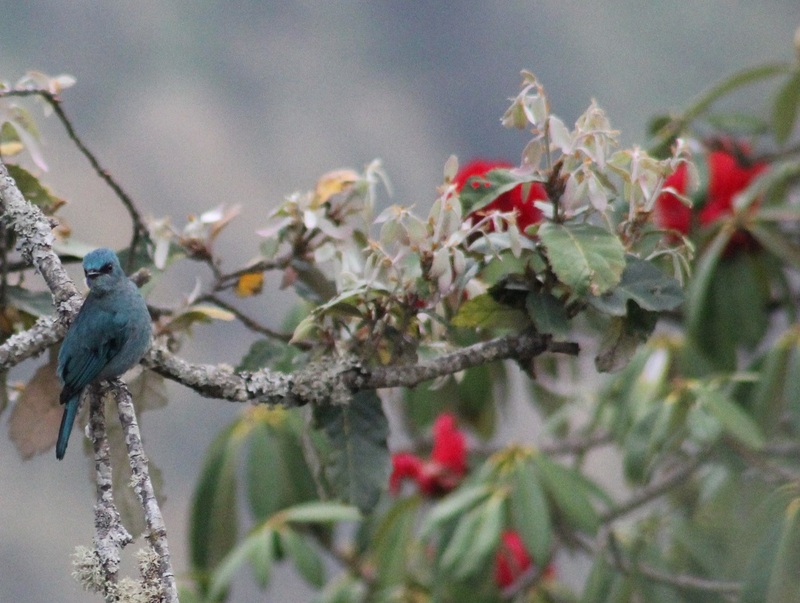 A Verditer Flycatcher was my final catch of the day’s walk. As it is wont with birds I had the wide angle on my camera when I spotted the it. I went into a frenzy to change the lens. This was one patient bird. It let me finish the job and posed for at least 5 shots before it decided enough was enough. 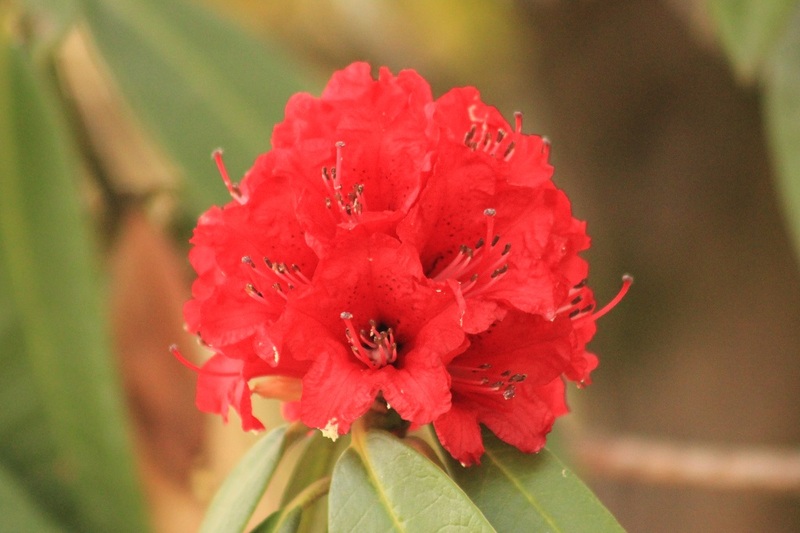 I now know that rhododendrons bloom in April! 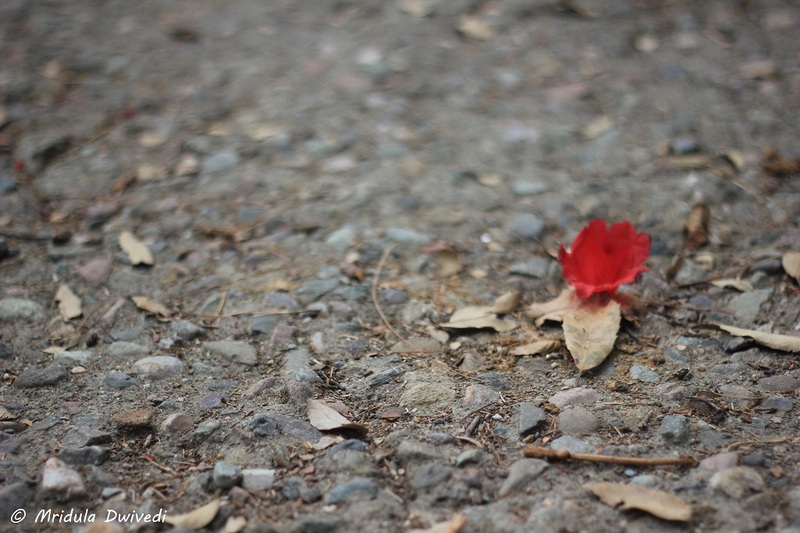 I hope I will walk a path again that would be full of blooms. PS. You can see why I said I went bonkers, I can’t remember when I used 16 pictures in a single post!